Home » Local Business Blog » What Shots Does My Dog Need To Be Groomed? What Shots Does My Dog Need To Be Groomed? This post was written with the expertise of Groom - Dog Care With Love, a company that provides Dog Grooming in West Hollywood, CA. Grooming keeps our dogs neat and beautiful. We just want to rush to them and hug them (that is, if they do not run to us first) after they are groomed. However, most salons will not admit your dog for grooming, unless you provide a certificate of vaccination. This is done in good faith. Failure to vaccinate your dog for a long time puts both people and animals at risk. As a cautionary measure against the spread of diseases and aggressiveness, you will be required to vaccinate your pet before visiting a grooming salon. With the exception of Hawaii, most states in the US require dogs to be vaccinated regularly and not just for the sake of grooming. Even though vaccination requirements differ in most states, rabies vaccination is mandatory in all states. Some states like Iowa have more vaccine requirements than others. New York has the strictest rules when it comes to vaccination. Under the New York City Administrative Code- Laws of New York, no dog is allowed in any public establishment unless the owner of the dog provides sufficient proof of a visit to the veterinary office, such as a vaccination certificate or a receipt. According to Charlotte the dog trainer, who does local dog training in Kansas City, most groomers are very cautious when it comes to vaccination. They require that ample time be given to dogs to monitor their responses to the shots. They will therefore not admit a pet for a grooming session if he got vaccinated 48 or fewer hours ago. Rabies is a very dangerous virus that affects both dogs and humans. Rabies vaccination is mandatory in most states due to the infectious nature of the virus. Dogs are first vaccinated when they are 3 or 4 months old and then again at one year of age. Subsequent vaccination can be done yearly, or once after every two or three years. Since it is done after a long time, convincing a groomer that your dog is vaccinated against rabies may be tricky if you do not have the proper documents to back up your claim. Rabies has a 100% fatality rate for dogs since it has no cure. Prevention through vaccination is very important. Pups and adolescent dogs are the most vulnerable to canine distemper. Just like rabies, this infection has no known cure and prevention is the only sure way of protecting your dog from the virus. The first dosage of the distemper shot is given when the pup is around six weeks of age. At least three 3 doses are given between 6 and 16 weeks and a booster dose is given a year after the first series of doses. Thereafter, the dog can be vaccinated with 2 doses after every 3 or 4 weeks, with a booster after every 3 years. This is a life-threatening virus that attacks heart muscles and leads to heart problems. It is highly resistant and can survive in an environment for months. It has no cure. However, it can be prevented using a vaccine. This vaccine is usually administered as a combination with other vaccines. Referred to as the ‘5-in-1’, the vaccine comprises of Distemper, Hepatitis, Parainfluenza, and Parvovirus (DHPP). Three doses are usually administered when the puppies are six to sixteen weeks of age. Another booster vaccine is given to them when they are one year old. After that, two doses are given after every 3 or four weeks, with a booster after every 3 years. The virus- Bordetella bronchiseptica causes inflammation of respiratory system, which results in what is known as the kennel cough. Although kennel cough is treatable, Bordetella vaccination is very necessary due to the contagious nature of the virus. Your dog may not be allowed in most public facilities without proof of this vaccination. Two doses are usually given to dogs under 16 weeks of age. For adult dogs, one intranasal dose or two injected doses are needed. Subsequently, a booster can be given annually or semi-annually. Caused by bacteria, this infection is more prevalent in areas with moist climates. It is often included in the ‘5-in-1’ vaccine, the new combination is thus referred to as the DHLPP. It is usually administered at least once a year for dogs in high risk areas. Humans are also susceptible to this infection. The disease is transmitted by ticks. It has no cure, although symptoms can be controlled with rigorous medication. Vaccination is highly recommended. First dose is administered to dogs around 9 weeks of age and another dose two to four weeks after the initial dose. For adult dogs, 2 doses should be given every 2 to 4 weeks apart with an annual boost. Dogs should be vaccinated 2 to 4 weeks apart (with the exception of rabies) with an annual booster, because dogs have poor immunity. You should always keep vaccination documents, such as receipts and certificates as proof of vaccination. You should let the dog rest for at least 3 days after vaccination, before taking him to a groomer. 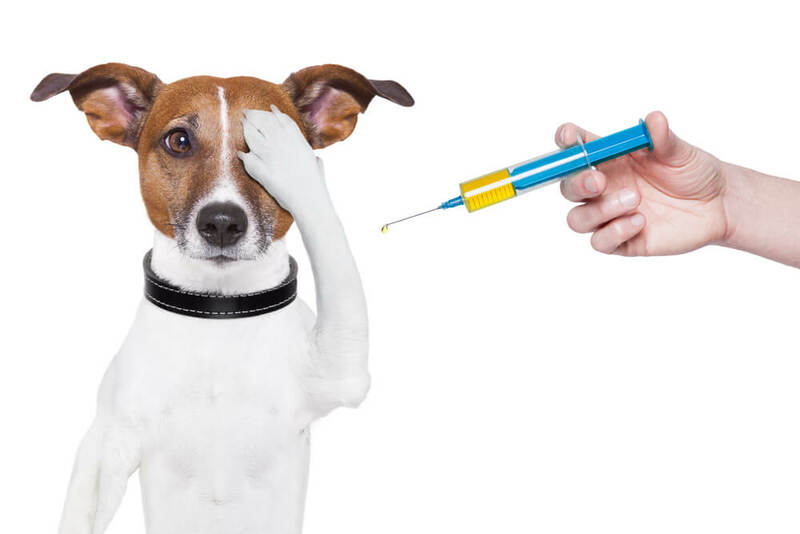 This is a precautionary measure to ensure your dog has not reacted negatively to the vaccines.